Hey everyone! I have so many projects I want to share with you! Lots of fun stuff from CHA and just general crafting. I’d like to start with a card I did for a Make & Take at the Hero Arts Booth at CHAW’16 (by the way, check out this video from the booth – closer look at new products), I have another project (its a super fun one!) I want to share as well, but I hope to film a video for it and will share later. I used the new Balloon Animals stamp set for this card. I love love love that it has an outline and a solid image that go so well together! You can stamp the outline exactly on top of the solid or have it slightly offset – either way looks awesome! There’s also a set of matching dies (we all need dies, don’t we? ), however I fussy cut my images out. I used Hero Arts Butter Bar and Bubblegum daubers (you can also use ink pads) to color strips of cardstock – the yellow one on the left and the pink one for the sentiment. I love using my inks to color little bits of cardstock to match my projects, makes it so very easy! 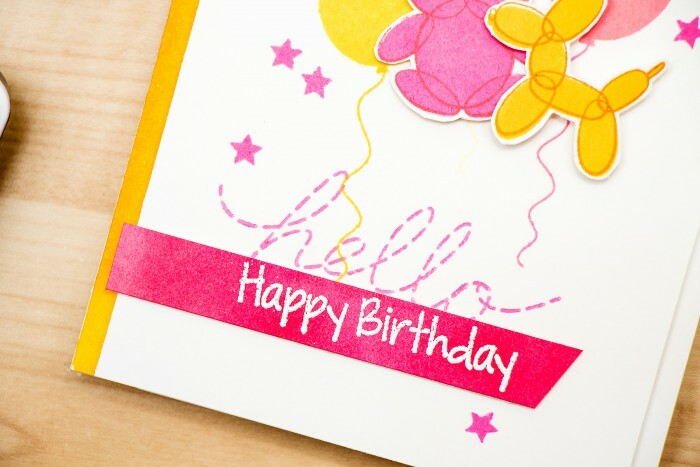 I combined two sentiment for this project – Hello and Happy Birthday, the Hello one was stamped in the background and was used to fill out the empty area above the main sentiment. So cute! Love the balloon animals. I want to get some of the scented inks I saw in the video, for my sisters. (they’re teachers) I’m going to make them some personalized stamps to use with them. Thank you! I’m excited about these as well. I wonder how long the smell lasts, I’ve seen embossing powders with smell that lasts about 2-3 weeks. Wonder if these would last as long.